From over Sixty years, Eleiko has been making peoples’ life stronger by providing greater quality sports equipment worldwide for international power lifting, weightlifting and multipurpose strength training. Being certified with IWF, IPF and Para-power lifting state, the company provides genuine and unique products. Eleiko is a renowned company and delivers its products to more than 170 countries around the world, making them one of the largest, respected and trusted provider of training equipment. 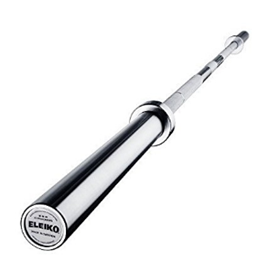 The Eleiko barbell is used in many weightlifting, Olympic competitions and luckily enough over 1,000 world records are set up with this quality barbell. Thus providing extensive quality, invention and very responsive customer feedback, Eleiko is considered as one of the leading manufacturers for strength and durability. When it comes to barbell, Eleiko shows great focus and determination on creating a fine piece of equipment with the help of engineers and professional trainers. The Eleiko Olympic Weightlifting training barconsist of great features and specifications in a very budget friendly price tag. The bar has a weight of 20 kg and can withstand weight up to 1500 kg. The length of the barbell is 2200 mm while the diameter of shaft is 28mm which is kept very standard. The bar is certified and verified according to IWF and IPF standards. The bar consist of ten needle bearings, five on each sleeve. The bar is constructed with high quality Swedish steel which is considered one of the purest steel around the world, while having a tensile strength of 215,000 PSI this bar is very sturdy as well. The sleeves and grip consist of chrome coat which is very durable and prevents the bar from rust. While having a weightlifting knurling mark with a grip diameter of 28mm too. The bar comes with a massive manufacturer warranty of over twelve years. The Eleiko Olympic Weightlifting training bar consist of extensive feel and performance, better than most of competition bars. 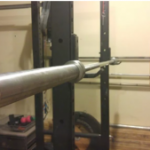 The best features of this barbell is the needle bearing that provides smooth and constant rotation which is highly required during heavy Olympic weight lifts. Along with that, the Eleiko Olympic weight lifting training bar consist of ten precision bearings, with sharp adjustable grip and high quality steel construction to fulfil the needs of lifters in an all in one package. The bar is made of Swedish steel which is one of Eleiko top secret material because it is tested to withstand weight of over 1000 kilograms without giving a bent and returning back to its shape whatsoever. With the high quality Swedish steel, the bar comes with a tensile strength of 215,000 PSI, which further facilitate barbells strength and make it durable enough.Having such excessive strength, Eleiko barbells comes with natural elasticity. Even 215,000 PSI weight pressure is less to make it bend or break apart, while the tensile strength of standard bars in this price range are usually 130K-140K PSI. The grip and feel of Eleiko barbell is designed taking great considerations. The knurling of the bar is pretty aggressive, however a beginner or an intermediate might find it a bit uncomfortable and pretty rough to the hands but when it comes to experience weightlifters, the grip is immensely well and comfortable for them. The center knurl is basically kept smooth to prevent the bar from damaging your neck and is very much of moderate so that it doesn’t slip during squat or clean. The spin of the barbell is a very essential and vital step to look upon because it is due to the spin by which most of the injuries takes place. A slower spin may put pressure and stress on your wrist, which ends up injuring it, while an excessive fast spin may provide you a good motion but doing that consistently end up dislocating your elbow. However, Eleiko laid great consideration on its spin and made it above average. It rotates 18% less than Eleiko competition bar, which also consist of same tensile strength and needle bearings. The Eleiko training bar provides a much less whip or oscillation when compared with its other version, the competition bar. Due to the fact the Eleiko Training bar is made of pure Swedish steel that provides greater stiffness and strength. All of Eleiko weightlifting bars are treated properly with steel to ensure the user have much stronger barbell along with flexibility, making it to come back in place after every bend due to heavy lifts. Having a beautiful chrome coating, Eleiko ensures that the bar will serve them for longer time. Eleiko weightlifting bars are IWF certified and checked down to millimeter and milligram to find any defect or blemish on the bar. The barbell is passed through many ultra sound, magnetic particle test to check internal defects while assembling. 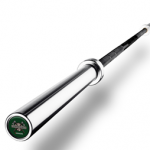 The barbell comes with a twelve year warranty against bending or breaking. It is recommended to drop the barbell on a floor padding and not to place them on metal racks. The bar comes with a weight of 20 kg and have the ability to withstand weight up to 1500kg. The length of the barbell is 2200 mm. 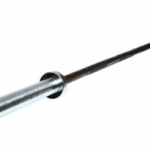 The shaft and grip diameter of the barbell is 28mm. The bar consist of ten needle bearings, five on each sleeve. The bar is constructed with pure Swedish steel. 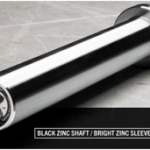 The coating on the shaft and sleeves are done with Chrome that prevents rust. The barbell is certified with IWF and IPF markings. The sleeves diameter of the barbell is 50mm. Weightlifting marking is done on the grip. 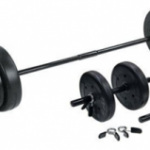 The barbell comes with a twelve year manufacturer warranty. In my opinion, the Eleiko Olympic Weightlifting training bar is constructed with superior quality, while having extensive features and benefits more than any other training bar. 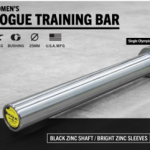 The price of this barbell was comparatively expensive than most of training bars, but seeing its durability, functionality and reviews made me to purchase this barbell very quickly. The first impression of this barbell was very bad, as it came in a very bad packaging and wasn’t shipped on time. However, when I opened the package the bar looked very new and consisted of extensive details. The grip and feel of the Eleiko training bar was really impressive, as I started working out with it I noticed that the grip is pretty aggressive and locked up on my hands which was very good, as I’m a professional weightlifter. The spin of the barbell was moderate which didn’t put excessive pressure on my wrist. Overall, I will say that this bar is very much recommended for professional weightlifters while intermediate can also benefit from it if they to increase their strength onto next level. Comes with a massive tensile strength of 215K PSI which can withstand the weight up to 1500 pounds. The bar is coated with chrome that doesn’t need excessive maintenance and prevents the bar from rust and corrosion. The pure Swedish steel increases the barbell stiffness. The knurling done on the barbell is very aggressive that provides great grip while doing high intensity workout. The center knurl consist of moderate knurling which doesn’t damages your neck while performing squats. The bar is really expensive. Doesn’t comes in good packaging and shipment is very late. The aggressive knurl isn’t really recommended for beginners, as it may damage their hand. Due to excessive stiffness the whip of the bar is very less.